Thank you, thank you Kelley Armstrong. This story is exactly what I wanted and needed to say goodbye to my beloved Clay and Elena. 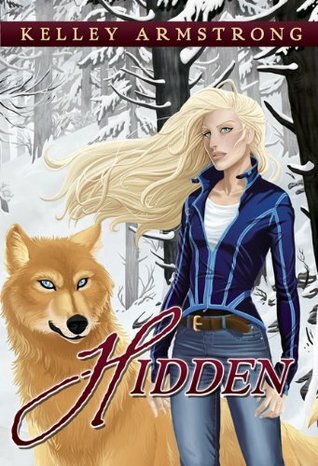 “Hidden” is a novella for the fans. It’s not for people new to the Otherworld series. Yes, it would still make sense, but it wouldn’t resonate. It wouldn’t mean to you what it means to us. The basic premise is that Clay and Elena have brought their four year old twins away to a cabin to celebrate Christmas as a family. But the appearance of a mutt threatens their holiday celebration. And the couple must figure out whether he is linked to a suspicious death in the area, while juggling their time with their kids. It was so easy to slide back into this world, with these characters who have become so familiar. That’s part of what makes it so satisfying. The other part, is knowing we have seen the complete evolution of Elena. She has come so far since Bitten. Now she has finally found peace as Clay’s mate… as Alpha-elect of the Pack… and as a mom to Kate and Logan. Reading this story shows us the last few pieces falling into place. She finally has everything she always wanted –even though it’s nothing like she would have pictured it. The external conflict keeps the story moving forward –with an unexpected twist at the end. But it also shows that werewolf problems and danger are simply another part of the life Clay and Elena lead. It’s part of what it means for them to be Pack, and will always exist, just like their connection with one another, their packmates, and their kids. It’s all here. And I couldn’t be happier with how it was done. –I’ll definitely miss these characters, but this is a great way to send them off. 5 stars. Yikes! It is expensive for a novella… Bitten was one of the best PNRs I have read, it was such a wonderful book. I know not everyone considers it a romance, but I do, their relationship took a lot of hard work but boy they are one explosive couple. I admit that I didn’t like the rest of the series and I kind of lost interest halfway through, except for the books with Clay and Elena. I love them, one of my favorite couples and I’m really tempted to get this book but seriously, $5.99 for a novella? That’s too much! And I just checked her website and the illustrations are not even included… But I’m tempted, and you make it sound sooo good! I have read the novellas in Men of the Otherworld and Women of the Otherworld about how Clay became a werewolf and how they met in college like 100 times! Can’t get enough of them! It was 200 pages. And for me, it was worth it. Such a great ending for Clay & Elena!